A small circle: What would you ask? After initial resistance to the idea, the White House agreed last week to allow National Security Adviser Condoleeza Rice to testify publicly before the commission investigating the U.S. government's preparedness and response to the attacks on September 11, 2001. What would you ask Condoleezza Rice if you were serving on the commission? Would she have testifed if the media hadn't publicized her refusual? It is now clear that certain federal employees such as the FBI in the Minneapolis/St Paul office and the Phoenix, AZ office had information that, had it been followed up, could have prevented 9/11. These people were ignored or reprimanded. Time even ran a story on one lady FBI agent. The people in D.C. that did not take action were either promoted or reassigned. None suffered for their awful behavior. Can something tangible be done to make the D.C. folks pay for their arrogance? What concrete steps have now been taken to insure that this does not happen again? If 9/11 didn't happen, would we have gone to war and invaded Iraq anyway? Have you recommended to the president the firing of any individuals that were negligent in the intelligence services in detecting the people that carried out the suicide attacks against the U.S. and wrongly analyzed WMD in Iraq? Prior to 9/11, what did you perceive as the most dire and imminent threat to the security of the United States of America? Even if the administration had early on identified al Qaida as the primary threat to the country, and subsequently devoted the bulk of your time and resources to combatting it, could we have prevented the 9/11 attacks? My question to Dr. Rice or any member of the Bush Administration would be this one: "In the run-up to 9/11 did you make ANY mistakes?" I know this sounds simplistic, but it is worth asking, given that this administration likes to portray itself as infallible and views any admission of even the slightest error as an indication of weakness. Would it have been helpful if those in the Clinton administration who had worked on terrorism (besides Clarke), had been contacted when the threat of terrorism was growing in the late summer of 2001 for any additional input, and would this kind of contact be helpful in the future? Why did you go on so many talk shows while still resisting testifying before the commission? Do you feel the same people questioning you should be asked what they could have done better, in the defense of our country, as members of various committees charged with the defense of our country? Did you or did you not review the actions taken by the Clinton Administration to combat terrorism before you prepared your speech on a Missile Defense Program as being the #1 thing the U.S. should be concerned with doing? The speech was supposed to be given on September 11, 2001. Why do you think that all the hype about having you appear under oath has become a circus? Do you feel like a scapegoat for other people that have more to hide? Why were relatives of Usama bin Laden permitted to fly home to Saudi Arabia the day after the 9/11 attack? I would ask, "Why are you here? This is political theater, pure and simple. I for one, do not want to participate in this charade. I have no further questions or, more importantly, comments. You have told us in private all that we need to know to make decisions on 9/11 events." When did President Bush start talking about invading Iraq? If the CIA didn't have concrete evidence of WMD, why didn't we find out for sure before we sent troops into Iraq? Ms. Rice, do you now regret your position that you would be setting precedent by testifying before this commision, when in fact, you are not setting precedent? Prior to 9/11, there was "chatter" regarding a possible Al Qaeda attack. In any of these reports, was Iraq linked in any shape or form as a clear and present danger? I would like you to ask this panel, why you are being questioned? The obvious question is not what the Bush Administration knew, or didn't know beforehand. Rather, why didn't his predecessor take a proactive course of action as President Bush has in dealing with terrorism worldwide? The real problem to me is to deal with the war on terror first, then take care of intel problems second. Why is she speaking at all? She is an advisor to the President and her counsel is none of our business! Was our intelligence network crippled by the privacy acts imposed in the last 10 years. Did you or do you see any signs that the lack of response during the Clinton years gave al Qaida the momentum to finalize their act of war? On April 2, 2004, the newspaper "The Independent" reported that a translater named Sibel Edmonds testified to the commission that information was circulating within the FBI in the spring and summer of 2001 suggesting that an attack using aircraft was just months away and the terrorists were in place. As Richard Clarke suggests, Dr. Rice could have convened a meeting that included the heads of the FBI, CIA, and Mr. Clarke. Dr. Rice could have impressed upon the FBI Director that the possibility of terrorist attack an "urgent priority." Dr. Rice could have motivated the FBI to look harder and recognize that it already had information about an impending attack. Questions: 1) Was not the NSC the only means of linking domestic intelligence obtained by the FBI with those in the CIA and White House working to prevent a foreign terrorist operation? 2) Is the failure of the NSC to detect the 9/11 attack a failure on the part of Dr. Rice, the head of the NSC? 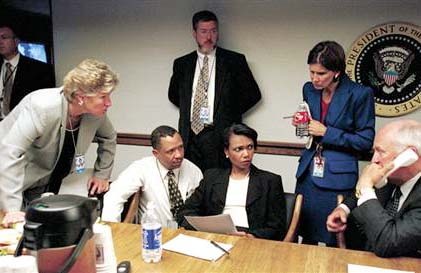 If not Dr. Rice, who in Government is more responsible for the failure to detect the 9/11 attack? Why did you say that no one could have predicted that someone would crash an airliner into a building when there is ample evidence that the US. knew of several plans by terrorists to do just that? Don't you think you and the Bush admnistration owe the 9/11 family members an apology? Why were bin Laden's family members allowed to leave the country immediately after the attacks, even while all other craft remained grounded? Who made this decision, why, and how does it serve our national security interest going forward? My question to Dr. Rice would be, as National Security Advisor to the President, who would you advise the President as a bigger threat- Saddam Hussein or Osama bin Laden? What if the September 11, 2001 attack had never happened? Name: Ron Nicholson, like Ms. Rice a student of Josep Korbel, Madelline Albright's father. How has the invasion and occupation of Iraq materially improved the safety and well being of the American people? How specifically has it aided the war on terrorism? If you believe the Bush Administration deserves credit for it successes will you also accept the responsibility for its failures? How many lost lives are going to be brought back as a result of the findings in this interview? None? So why is it so important for you to testify? Oh, it is all a political move since the elections are before us. Thank you, no further questions. If you were a family member of someone killed in one of the terrorist attacks, wouldn't you feel entitled to the testimony the 9/11 commission is seeking? Why was your voice trembling on your appearance on Meet the press prior to the Iraq war? "I don't think anybody could have predicted that these people would take an airplane and slam it into the World Trade Center, that they would try to use an airplane as a missile - a hijacked airplane as a missile." 1. Abdul Hakim Murad, one of the bombers in the first World Trade Center attack in 1993, described while under interrogation in 1995 a plot to use airplanes as missiles against the White House, the CIA, and other prominent American targets. Were you not aware of this? 2. Ramzi Yousef, one of the masterminds behind the 1993 bombing of the World Trade Center, confirmed the testimony of Abdul Hakim Murad by describing in 1997 plots to use commercial airplanes as missiles. FBI agents who testified in the trial of Yousef further corroborated these statements. Were you not aware of this? 3. In 1993, the same year as the first World Trade Center attack, a $150,000 study was undertaken by the Pentagon to investigate the possibility of airplanes being used as bombs. A draft document of this was circulated throughout the Pentagon, the Justice Department, and to the Federal Emergency Management Agency. Were you not aware of this? 4. The 1993 Pentagon report was followed up in September 1999 by a report titled 'The Sociology and Psychology of Terrorism.' This report was prepared for the American intelligence community by the Federal ResearchDivision, an adjunct of the Library of Congress. The report stated, "Suicide bombers belonging to Al Qaida's martyrdom battalion could crash-land an aircraft packed with high explosives into the Pentagon, the headquarters of the CIA, or the White House." Were you not aware of this? 5. In 1994, a disgruntled Federal Express employee invaded the cockpit of a DC10 with the intention of crashing it into a company building. Were you not aware of this? 6. Again in 1994, a pilot intentionally crashed a small airplane into a tree on the White House grounds, narrowly missing the building itself. He clearly intended to smash the plane into the building. Were you not aware of this? 7. Also in 1994, an Air France flight was hijacked by members of a terrorist organization called the Armed Islamic Group, who intended to crash the plane into the Eiffel Tower. Were you not aware of this? Given the testimony of Murad in 1995, the testimony of Yousef in 1997, the FBI agents who were witnesses in the trial of Yousef in 1997, the Pentagon report detailing the airplane-bomb threat in 1993, the 1999 report from the Federal Research Division which described the airplane-bomb threat and named al Qaeda specifically, the attempt by the Federal Express employee to use an airplane as a bomb, the airplane attack on the White House, and the attempt by the Armed Islamic Group to use an airplane as a bomb against the Eiffel Tower, do you find it at all inconsistent to claim that no one could have predicted the use of an airplane as a terror weapon? Isn't it more likely that you and the administration were the ones who could never imagine the use of airplanes as weapons, because you were not treating the terror threat as a priority and were therefore not privy to all the data regarding the threat that was readily available? There is someone in this hearing room right now named Sibel Edmonds. Ms. Edmonds was hired by the FBI as a translator nine days after the terrorist attacks. She has already testified privately before this panel. In her testimony, she stated that she personally saw documentary evidence which proves you were wrong when you claimed there was no advance warning of air attacks on U.S. soil. Ms. Edmonds saw intelligence documents that pointed to the use of aircraft against skyscrapers and other important buildings in New York, Washington and five other cities. Inan interview Ms. Edmonds gave to the Toronto Star on April 5, 2004, she said, "There was specific information on the use of airplanes. There were people issuing orders and information on people already in place in this country months before Sept. 11. But she (Rice) is saying 'we' did not know, including herself, her advisers and the FBI. That statement is not accurate. It's a lie and a lie is a lie." How do you respond to these statements from Ms. Edmonds? Remember, she is sitting right behind you. 13 Jul 2006 @ 23:06: The Law of Attraction?